Heaviness in your chest could be due to a cause as simple as indigestion but it could be as serious as a heart attack. Find out what to do if this condition occurs. Of course, it is not a heart attack every time you experience heaviness in the chest, but it is possible. You should consider other signs to determine what you're feeling is actually a heart attack or not. If it is a heart attack, you're more likely to experience chest heaviness with constriction. You may experience pain in the center of your chest accompaning by tingling or pain in the shoulder, arm, jaw, or back. You may also feel anxiety, shortness of breath, nausea, wheezing, coughing, and possible vomiting. Sometimes, you don't experience any pain at all – it's called a"silent"heart attack when you don't even realize it has happened. It is for these reasons that you should not ignore it and see your healthcare provider immediately. Indigestion may lead to tightness in chest. It can be quite frightening because the discomfort moves upward towards the arms. However, it usually feels that something is there inside your chest if your discomfort is due to indigestion. Gas and belching are other common symptoms of indigestion. You may also be a sufferer of Gastro Esophageal Reflux Disease or commonly known as heartburn, acid reflux, or GERD. In this condition, the acid in your stomach moves upwards through the esophageal sphincter. It sometimes get stuck and causes chest heaviness. It usually happens when you eat too fast or engage in activities soon after finishing your meals. Going on a GERD diet may help resolve the issue. You may notice chest discomfort if you're suffering from a sleep disorder such as sleep apnea or sleep paralysis. You will wake up in the middle of the night due to chest discomfort if you're suffering from sleep paralysis, whereas sleep apnea refers to blockage in your nasal passage that stops you from breathing for a short time. You will wake up suddenly in both cases with pressure on your chest and fear. There is no permanent cure for these disorders, but your doctor may prescribe specific medicines to manage your condition. Your chest heaviness may be a symptom of a panic attack. Other symptoms are increased heartbeat, tightness in throat, perspiration, tremors, and restlessness. You experience these symptoms when you're under a lot of stress, and this puts pressure on your chest muscles and weakens them. This leads to heaviness in chest. While many symptoms of a panic attack are the same as in a heart attack, you don't usually experience any radiating pain that's associated with a heart attack only. You may have to take oral medicines and try different therapeutic techniques to manage stress and avoid panic attacks. The chest tightness you're experiencing may well be due to a direct injury to your rib cage. It could be a fracture or simple bruising. Sometimes, the heaviness is due to muscle soreness, caused usually after being engaged in heavy activities. 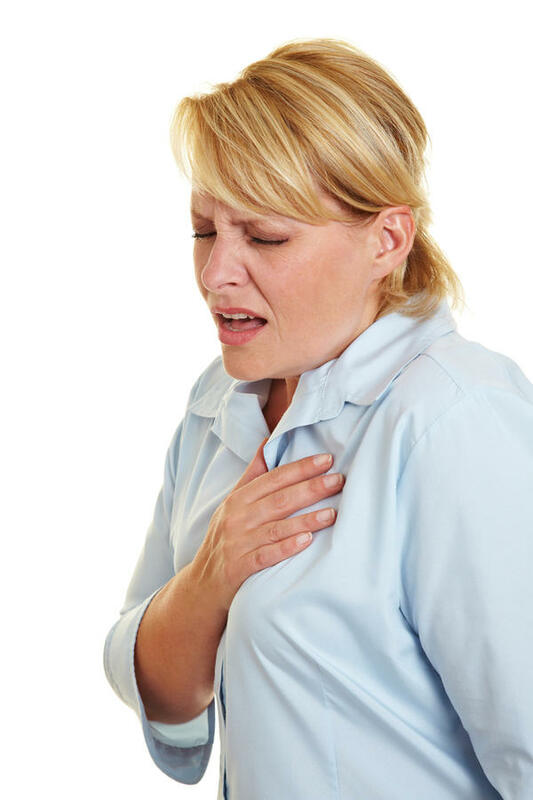 Angina also feels like tightness and heaviness in your chest. You experience it due to arterial plaque, hypertension, inflammation of the chest wall, spasm of the esophagus, and so on. You should go on a diet with low fat content and plenty of dietary fiber to keep your blood cholesterol level low. Staying active and exercising will also help reduce your cholesterol. You may experience chest tightness and heaviness during an asthma attack. You may notice heaviness in the chest due to pneumonia and allergies. Your chest tightness may well be the outcome of a trapped nerve in the chest. First thing first, don't panic when you experience chest pain or tightness. Getting anxious won't do you any good. In fact, you will aggravate your symptoms by getting anxious and stressed. However, it is important not to take things lightly because it could be due to a heart attack. You should arrange a visit to your doctor immediately for further evaluation. This will help identify the best treatment for the actual cause. With proper evaluation and diagnosis, you can prevent it from happening again. Your doctor may recommend chest X-ray, EKG (ECG), and serum enzymes marker for heart attack. After diagnosis, she.he will recommend proper treatment options for your condition.